Meetings between Real Madrid and Borussia Dortmund have become a regular event in recent years and made for some special matches. On their return to the Champions League, Tuchel’s new-look side played host to Zinedine Zidane’s reigning-champions. Dortmund’s 4-3-3 against Madrid’s 4-2-1-3. Marc Bartra was left out of the squad and his place was taken by Matthias Ginter. Ousmane Dembélé rather surprisingly started ahead of the more-experienced Andre Schürrle whilst Guerreiro this-time played on the left-wing, with Castro joining Götze and Weigl in the midfield triangle. Danilo was forced to switch sides and defend the left flank in the absence of Marcelo. James played at the attacking tip of Madrid’s midfield trio behind the ever-threatening Bale, Benzema and Ronaldo. ZIdane’s team took a rather conservative approach to the match, and the lion’s share of possession was immediately conceded to the hosts. Without the ball, they often varied their focus during Dortmund’s build-up phase. In some cases, they sat passive against the centre-backs, and covered Weigl through man-orientations and cover shadows in particular. Yet in other moments, Benzema or another individual would move all the way up to Bürki. When they did press, it was somewhat effective in disrupting Dortmund’s construction of possession, forcing a couple of turnovers still in the hosts’ half. As many teams do against Dortmund, they cut off the near options and focused on removing Weigl from the build-up. However, this was only on a occasional basis and Tuchel’s side controlled the rhythm of the match to begin with. Weigl was ever-present in the build-up, despite Madrid’s efforts to cover him, and made 100 passes with a couple of line-breaking ones between midfield passing-lanes. In the increasingly-common moments where Madrid didn’t press, it was quite easy for Dortmund to overload Benzema. It was often Modric or James who would push out of midfield in support, but it was generally insufficient and Ginter in particular was able to carry the ball and gain yards. Alternatively, it could’ve been planned to try and force a mistake out of Ginter, who isn’t known for his ball-playing ability, but if it was – it wasn’t particularly successful. Aside from the passivity against Dortmund’s deeper players, Real Madrid were often quite uncompact – not a healthy mix. With James often taking a position closer to the forwards and the two wingers being fairly inactive, Kroos and Modric were given a large amount of grass to cover. James’ role was often to stick closely to Weigl and take him out of the game (though that is easier said than done) and because of this, his capacity to support his deeper teammates was reduced. Although at times the Colombian would drop to create a 4-5-1 structure, there were a number of cases where Modric and Kroos were simply over-encumbered. An attack of Bale, Benzema and Ronaldo is arguably the best-suited counter-attacking trio in the world, and Zidane looked to exercise this away from home. During moments of transition, the three would often stretch quite wide and receive direct passes from deep. There was almost at least one runner from midfield, which was usually James but Modric had some influence from deep too. The direct running of the two wide men, paired with the stronger holding-up and team-play of Benzema made Madrid a threat immediately following a Dortmund turnover. They were often reached initially with a direct pass, as opposed to a more short and combinative build-up. 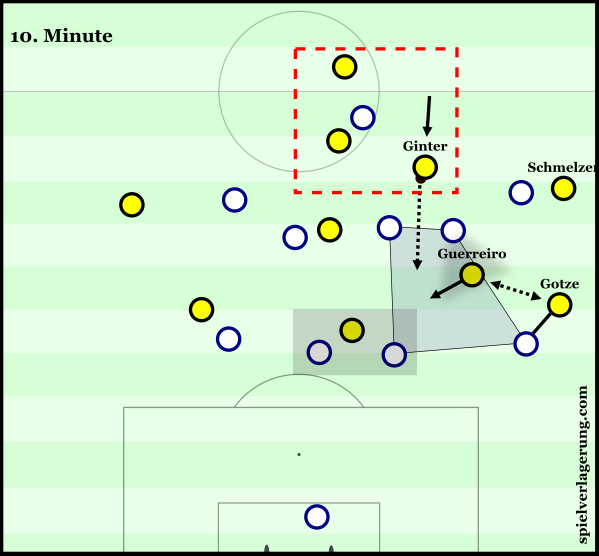 With one forward holding the ball up, movement on either side of it was fairly effective in creating routes to quickly move the ball into Dortmund’s third. Aside from this, channel balls were fairly regular into the gaps on either side of the centre-backs. It was one of these counter-attacks which resulted in Ronaldo’s well-taken 16th minute goal. Modric played a pin-point outside-of-the-boot pass to Benzema who had moved wide to find space. The French striker then played the ball back inside to Kroos and a 5v4 had formed in favour of the attacking team. Dortmund’s passing-map. Notice Dembélé’s lack of involvement and Weigl’s excellent connecting. of @11tegen11. The left side of Dortmund’s structure is becoming increasingly-dynamic after the recruitment of left-back Raphael Guerreiro, who has featured largely in the midfield. A trio of Schmelzer, Guerreiro and Dembélé has been a common sight and quickly developed into an exciting area of Dortmund’s attack. With Guerreiro capable of playing in all three positions, the triangle is highly dynamic and capable of various position switches and adaptions going forward. The Portuguese left-back looks more-than comfortable in the 8 position and is often balancing Schmelzer’s movements forward or rotating with Dembélé to help his teammate find gaps in the left half-space. 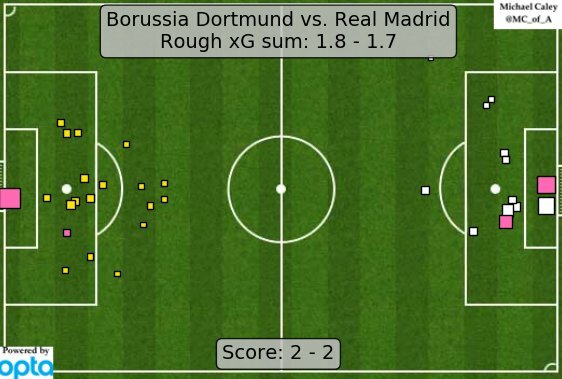 While the composition was slightly altered last night, it was still a focal point of Dortmund’s possession game. In this case, it was Guerreiro who acted on the wings, whilst Mario Götze took over the left 8 position. A proponent of situationally-appropriate and structure-complementing movements, he’s a good fit for such a role and theoretically, his player profile is even better-suited than the more individualistic Dembélé. Guerreiro and Gotze rotated commonly, which helped to create space for one-another. Similarly to when Dembélé is on the left, Götze and Guerreiro made a number of fixed rotations, where the players would swap spaces for prolonged attacks or periods of the game. This was one of a few strategies to try and disorient the visiting midfielders, as well as create space through stretching the CB – RB channel or increasing the distance between Madrid lines as what happened on the left. Through this left-sided structure, Dortmund looked to play with fast and rather direct combinations through lines of defence. Such interplays were quite vertical as they intended to penetrate the 10 space quickly against the opposing press. Ginter was able to move up in the left half-space and although he isn’t known for his passing like Bartra is, he helped to initiate attacks with some direct passes. The constant and harmonious movement allowed for small overloads to be found, whilst individuals got a step-ahead of their man which helped combinations to be penetrative. By making fast movements with clear coordination and understanding between teammates, Dortmund players were able to move faster than their anticipating defenders and thus could create space simply by acting quicker. It was an important aspect of their combinations, and allowed the ball movement to be quick and direct against pressure from Madrid. Aubameyang even participated in such moments of times. The Gabonese forward made common dropping movements diagonally into the left half-space, where he would add another point to the left-sided structure and create diamonds. In doing so, he simply added to the potential overloads through the left side, while creating further connections and offering wall-passes for his midfield teammates. In contrast, the dynamics of the right-hand side were largely different. Down this flank, attacks often only consisted of the forward-moving Gonzalo Castro and the trickery of Ousmane Dembélé. 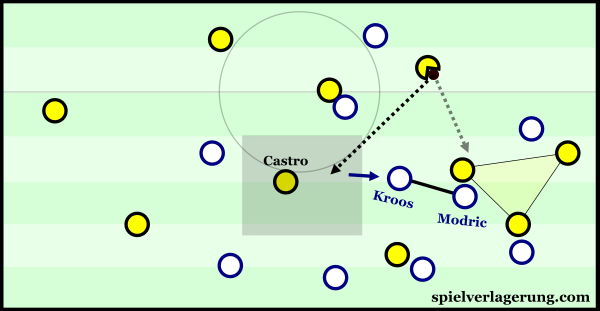 Castro often moved into high positions whilst Dembélé frequently looked to move the ball inside and attack directly against the defence. The French winger attempted 10 dribbles – the highest of the match by four – in comparison to Guerreiro’s two. 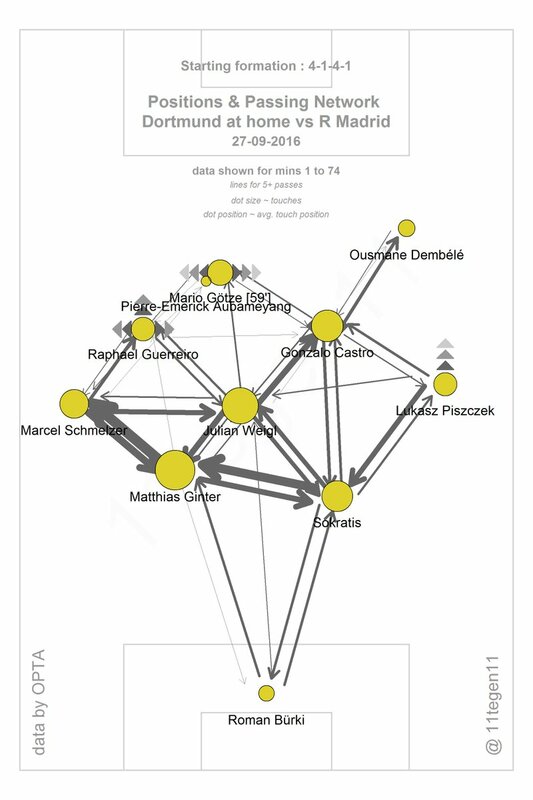 In addition, the Europameister made over double the amount of Dembélé’s passes, whilst Guerreiro’s map clearly shows a much greater inclination to supporting the build-up and midfield areas. Such a contrast is reflective not only of the player types (with Guerreiro far more team-focused than Dembélé), but also hints at the attacking strategies on either flank. Whilst the left side was more based around combining in groups of 3-5, attacking down the right consisted of more individual actions and direct carries to goal. With right-footed Danilo on the left-back position, Madrid were quite well-prepared to deal with the instances where Dembélé cut inside. He made 11 tackles throughout the game and coped with Dembélé’s slaloming much better than past opponents. If I were to make a criticism of the winger’s performance, his selection of dribbles was too predictable and repetitive. He most often looked to quickly knock the ball behind Danilo upon receiving it, and the Brazilian intercepted the large majority of attempts. Despite these issues, the right side offered a useful alternative to the more combinative nature of the left flank. The pair were often introduced into the attack via quick switches after drawing the defenders towards Götze and Guerreiro. From here they could receive and carry the ball directly towards goal, as they both like to do. During such moments, Castro was especially impressive. He moved well in the opposite half-space to drop in towards the centre-circle, where there was often space due to the collective focus down the left. With Ginter rarely under pressure, he could quickly make a diagonal to his open teammate as opposed to the vertical pass towards Götze, Aubameyang or Guerreiro. Castro received well in pockets of space during build-up down the left. For the first 30 minutes, Madrid’s play in settled possession was quite poor. Despite Modric and Kroos both dropping deep, they struggled to play through the lines with floor passes. As is often the case with this team, it stemmed mainly from a weak structure which had few linking players between the midfield and attack. James usually would advance and be on the same line as the three other forwards instead of looking to engage with his deeper teammates and provide a way to carry the ball upfield with it staying on the floor. Instead, they often resorted to long balls after being closed down by a Dortmund press. These attempts at attacking bore little fruit, and their counter-attacking goal was the only big chance of the first half. They eventually began to grow into the game, and had a better rhythm in possession after around 35 minutes in. They were able to progress the ball more often on the floor and weren’t as-often resorting to direct play. James was more engaged whilst the playmaking of Modric and Kroos became more progressive in the ball-circulation. As a result of the more successful build-up play, more developed attacks were able to be formed and the two deeper midfielders were able to apply their trade higher up the pitch when the ball was in the final third. Yet it was Borussia Dortmund who were to strike next, and pulled back an equaliser late before the end of the half. A Raphael Guerreiro free-kick was poorly dealt-with by Navas who palmed it to Ramos and Aubameyang. The ball ricocheted off of the defender but Auba claimed the goal by firing it in as the ball was crossing the line. However, the moment before the free-kick was important. It was another case of good playmaking from Ginter, who found Götze in space with a diagonal to the right after their teammates threatened to find space in the left half-space. Their activity on the left attracted attention and meant that Kroos didn’t have enough time to intercept the pass. Although Götze didn’t cleanly play through the pressure, his counterpressing regained the ball and he was able to pull the foul. After sneaking the equaliser before half-time, Dortmund re-emerged with a more defensive outlook on the game. They sat in a more passive defensive approach and Madrid had a greater share of the ball, which obviously suited Modric and Kroos. Thus, the rhythm of the game changed quite considerably. The visitors weren’t always able to progress through Dortmund’s lines quickly, but the midfield pairing saw many more touches of the ball which, when the midfielders in question are Modric and Kroos, can really only be a good thing. As for Dortmund, Tuchel’s side lost some of their rhythm in possession of the ball. They distinctly lacked verticality for sizable periods after half-time and struggled to break through Madrid’s midfield as they had done in the first 45. After conceding more possession and territory, it was a corner which brought the visitors back in front, with Varane also converting a tap-in after a short corner found two men free at the back post. Before the goal, Schürrle had entered the field in place of Mario Götze (with Guerreiro becoming a permanent eight once again) and shortly after, Dembélé’s outing came to an end in the form of Christian Pulisic’s introduction. Later, Emre Mor was given an opportunity in the midfield as he replaced Guerreiro in Dortmund’s final change. The ‘fresh legs’ did inspire some better attacking play from Dortmund, who moved the ball into Madrid’s third more frequently and with a faster dynamic. However the visitors had chances of their own, this time back in the same transitional manner in which they started the match. Both sides failed to convert any of their close opportunities, until two black and yellow substitutions combined for a spectacular goal. Pulisic received the ball wide and immediately got the better of Danilo and although his cross wasn’t met by Aubameyang’s over-head kick, it found its way to Schürrle who emphatically finished past Navas to level the scores late on. of Michael Caley’s (@MC_of_A) model. After officially returning to the Champions League with a dominating win in Warsaw, this was the Dortmund of Tuchel’s first ‘real’ European test. Yet the hosts held their own well against the star-studded Real Madrid side. Although aided by Aubameyang’s point-blank shot, expected goals’ perspective deemed the sides fairly equal. Real Madrid showed their quality to threaten at any time and were particularly worrisome on the break, while Dortmund controlled the game for the beginning. Real Madrid were the better side for the middle period of the game, and were able to progress the ball more cleanly through better links and pure individual quality of certain individuals. Fantastic piece. Can’t offer enough praise. Been reading the website for about 2 years now and I see so much more and love coming here to see if my own assertions about the game are correct. Guerreiro is some talent, the fact he can play anywhere through left & left half space is invaluable. Hopefully he can build on his early season form and become a key figure for BVB. Great article and I actually think Ginter is well suited when BVB play a 4-3-3 with Weigl as the pivot. He’s allowed some space to step up and look for vertical passes. I think his passing is quite good also. It would be interesting to see Ginter and Bartra play a few games together because it would make Dortmund extremely creative from deep on both sides of the pitch.